Albertville, from the north. To the left is St. James Church, known locally by its French name, Paroisse St. Jacques d'Albertville. 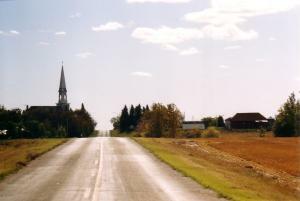 The church was built in 1922-23, and the steeple, approximately 46 metres (150 ft.) high, is one of the highest in Saskatchewan. Photograph taken September 23, 2003. Village, pop 110 (2006c), 132 (2001c), is located northeast of Prince Albert, a few km south of Hwy 355. The small community is dominated by St. James Church, the oldest existing structure in Albertville. The community's beginnings date to 1910 when French-Canadian settlers arrived from Plessisville, Quebec. Originally settling just west of Albertville, they established the hamlet of Henribourg. But by 1913 many more French settlers had arrived in the district, taking up land further east. A need for a larger, more centrally located church resulted in the location of present-day Albertville being chosen. In 1916, the village became home to La Caisse Populaire d'Albertville, Saskatchewan’s first credit union, 20 years before the province adopted the Credit Union Act. Another interesting early business established in the community was the Albertville Cheese Factory. Begun in 1918, it was in operation for approximately 25 years. The village was incorporated on January 1, 1986, and it straddles the boundary between the RM of Garden River No. 490 and the RM of Buckland No. 491.